Secular humanism only commits one to a few ideas: (1) we can be ethical and moral without god; (2) reject religious dogma, supernaturalism, pseudoscience, and superstition. The problem is that many atheist secular humanists only reject religious dogma. On non-religious topics, some atheists embrace dogma and tribalistic thinking all the way, whether they're aware of it or not. This is a form of the bias blind spot, which is when you recognize the biases in others, but fail to notice your own. 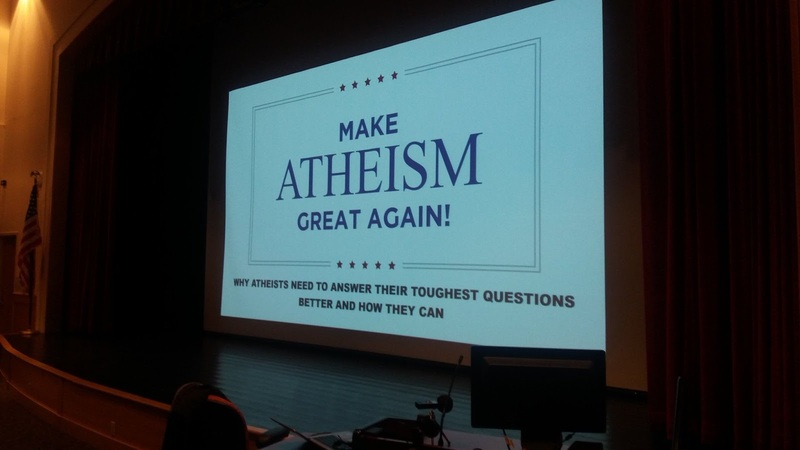 I just spoke at Long Island Atheists a few weeks ago for my Make Atheism Great Again! talk, which was supposed to be a prelude to the panel discussion of the same name at The Atheist Conference. In the talk I reminded the atheist crowd that "atheist" does not equal "critical thinker." Being an atheist does not entail you think critically about anything, even atheism, because one can be an atheist for really bad (or no) reasons. I encouraged them to double down on their verbal commitments to critical thinking, science, and reason, and to apply that to all areas of their lives, not just religion. The reason why I emphasized this is because the atheist community is not immune to bias and group-think. These are innate human tendencies that come easily and naturally to us that make it extremely hard if not impossible to be a critical thinker on all subjects. And it's the fact that those innate tendencies are so hard to overcome that I think makes the idea that we're all going to embrace a kind of secular humanism that commits itself to critical thinking, science, and reason a bit too naive. Therefore, the very thing that I think should replace religious belief is precisely the one thing I think humanity will have the most difficulty adopting, because critical thinking, scientific thinking, reason, and being mindful of, and proactive against one's cognitive biases go against our innate human tendencies for for bias and group-think. That being said, I think we have no better alternative than to double down on our efforts to promote critical thinking, science, reason, and something akin to secular humanism, even if it's just its most basic form of being ethical without god, and rejecting religious dogma, supernaturalism, pseudoscience, and superstition. Secular humanism doesn't tell you what's ethical, or exactly how to live (aside from not being religious), or exactly what is "the good life." And that seems to be its flaw. Nevertheless, I will take on secular humanism in light of all its flaws in my next post. Stay tuned!